Watercolour with pen and ink of the fort at Monghyr by James Tillyer Blunt (1765-1834) dating from 1788. 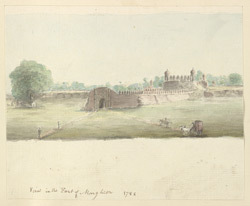 This watercolour is folio 12b from an album of 31 drawings in 29 folios of landscapes in Delhi, Uttar Pradesh, Bihar, Orissa, Madras and Mysore dating from 1788 to 1800. Monghyr is situated on the south bank of the Ganges in Bihar. From the rule of Akbar in the late 16th century, Monghyr was controlled by the Mughal Emperors. However, the town was also occupied by Mir Qasim, the Nawab of Bengal, during his conflict with the English in the second half of the 18th century. The main entrance of the fort, shown here, is the Lal Darwaza or Red Gate. The fort contained numerous public offices and the tomb of the Muslim saint Shah Mushk Nafa (d.1497).